Imagine a world where all marketing content was free… nobody had to fill out long lead sheets and gates to content were a thing of the past. Does that make your skin crawl? Give you a tight feeling in your chest? Have you already pushed back on the idea based on the fact that it’s simply just not done? 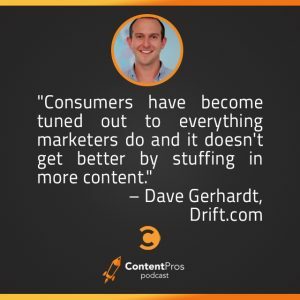 Dave is here to crash a Drift wrecking ball right through your notions of traditional marketing. Drift has truly turned the process upside down by making all of their content free and accessible to all. You can still subscribe to their blog, but even those leads are not immediately put into a sales funnel. Instead, they go into a workflow of human interaction where they receive a handful of well-thought out emails from Dave related to content that spurs them to sign up for Drift. Then, and only then, will a no-pressure sales process start based on what has now become a Product Qualified Lead (PQL). Still not wholly convinced that this is a workable approach to marketing? Well we’ll just say this… their announcement post about no more gated content and lead forms generated more email subscribers than any post they have ever published in the history of Drift. Sounds like it’s off to a great start already! As a kid, Dave wanted nothing more than to be an NBA player when he grew up. Sadly, once he didn’t grow past 5’8″, he had to find a Plan B. Since he played sports his whole life, he always thought he would grow up to be a career athlete in some form right up until college. Then he made a hard right for marketing at a software company and hasn’t looked back.